Remodelling Your Jewellery with Debra Fallowfield - Debra Fallowfield makes custom jewellery to fall in love with … Crafting every piece entirely by hand..
Reusing precious metal isn’t quite so straightforward – you may think all your various carat gold just gets melted together, but it’s more complicated than that. 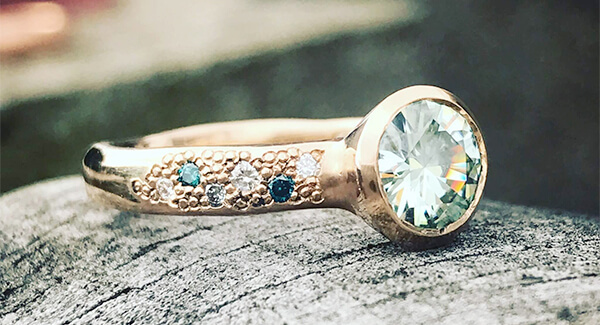 In fact, melting together old gold (of various carats and from different manufacturers) can create a whole lot of problems, including discolourations in the metal, pitting, and cracking. This is because all gold has some form of an alloy or various alloys mixed into it, and without expensive metal analysis, I have no idea what they are. There are normally 2 main reasons to remodel. First is that the jewellery holds sentimental value (possibly your grandparent’s ring) or for ethical reasons (so no new mining has to take place). First, your old gold will need to be refined to bring it back to a material I can work with. 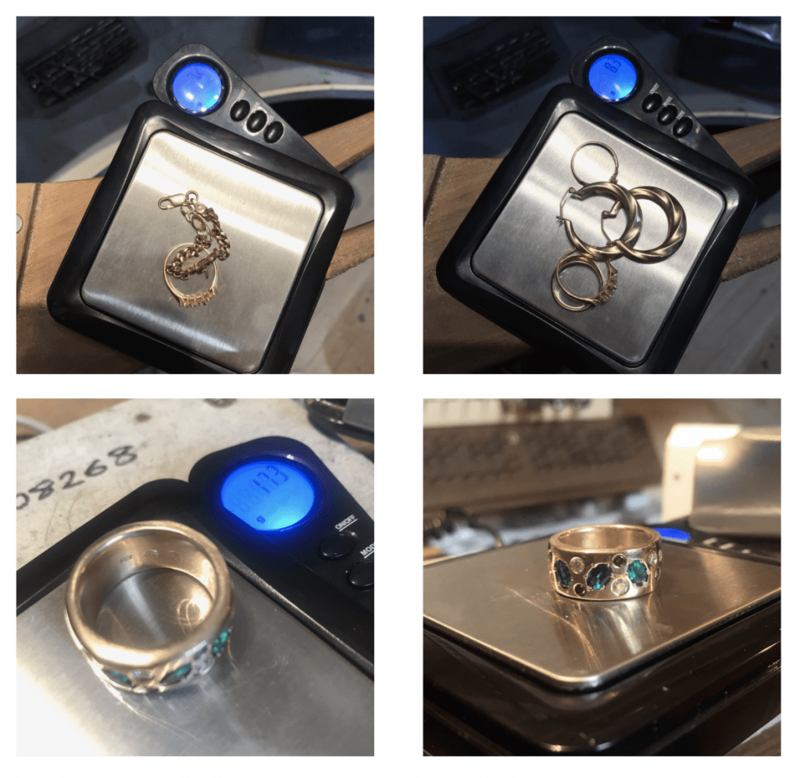 This is quite a long, expensive process which involves the jewellery being assessed, weighed, cleaned and any gemstones removed then sent to a refinery. During this process, all the impurities and any other alloys will be removed from the metal. It’ll and is then returned to me as granules, sheet or wire. 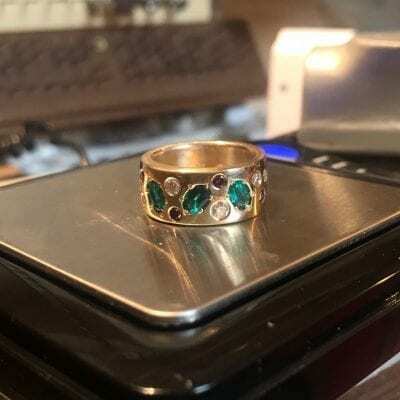 Most of the old gold I view is VERY lightweight in comparison to my work (my rings can weigh up to 10 times more than a commercially made mass produced ring). So more often than not I must add a considerable amount of new gold into the mix. I can mix different alloys with your refined gold granules before casting your new ring. Unfortunately, I CANNOT reuse sterling silver, as it is not economically viable, but if you want I can buy your old gold at scrap price and deduct that from a silver piece you are having crafted. Your gems will need to be of a decent quality to reuse. Often their size determines how they can be reused. Commonly the commercially made jewellery I see ( Pascoes, Michael Hill etc) will have badly cut, very low-grade gems in them, which often makes setting and reusing them near impossible. This is one of the reasons this kind of mass-produced jewellery is so cheap. Obviously, I will let you know whether they are reusable or not before we start. Please note that working with your gems is entirely at your own risk (you will be asked to sign a contract before work commences). Please note that the minimum for a gold remodel is $2800. However, if you wanted to credit the old gold towards a remodel in silver, expect to pay from $900. The amount of work in a remodel can often be 5 times longer than a piece started from scratch. Whilst every job is completely different I find most gold remodels sit in the $2900.00-$5,500 bracket (when crafting in a 9ct gold). Please send a photo of my designs you like the look of as a reference for creating your new piece. Provide your finger size and what colour gold you prefer. From this I should be able to give you a “ballpark” figure, however, sketches and a final quote cannot be ascertained until I have the old jewellery/gems in my possession. Once we have agreed upon a design I will send a remodelling contract through and ask you to sign and return to me before work commences. Usually, I am happy to take your old gold as a deposit towards the new work, however, if we need to purchase extra gems I may ask for a small deposit. Due to the high demand for my remodelling work, please allow up to 3 MONTHS for completion. Should you decide to leave your old jewellery with me and NOT get a remodel done, you have 6 months to pick up your old jewellery after which I will dispose of it. An old bracelet and ring with stones removed only weighs 7.2 grams. Another photo shows a bunch of old gold jewellery consisting of 3 rings and a pair of earrings which weighs 8.3 grams only. They haven’t been refined yet. During the refining process, up to a third of its original weight can be lost (this term is called “roasting”). Now see how much gold can be in a single one of my rings compared to a whole bunch of old gold!